The outfield trio of Harrison Bader, Jose Martinez and Marcell Ozuna was a big part of St. Louis' second-half resurgence that had the Cardinals in contention for the NL's second wild card until the season's final week and helped them not even miss Tommy Pham. National League rules, plus Matt Carpenter's presence at first base meant only three of those bats could be in the lineup at any one point, and Pham was the one who was dealt. All three Cardinals put up good to excellent numbers since the deal, but Pham still dwarfed them. St. Louis made the cardinal sin of trading a player at his low value, and Pham was red hot since the trade. 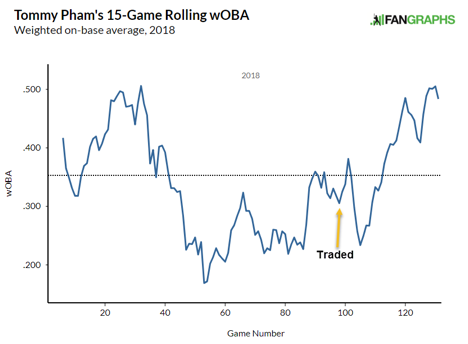 The hot summer of the other three certainly lessened the blow of losing the type of offense Pham provided, but Pham's contributions were an integral part of the Rays reaching 90 wins in a season where some thought they would lose 100. If you have read this column all year, you know the drill by now: what is the player doing differently that is leading to the resurgence at the plate?